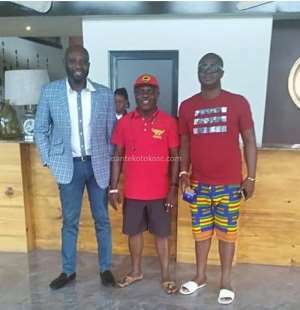 Ghana FA presidential hopeful, George Afriyie has arrived in Zambia to support Asante Kotoko ahead of their CAF Confederation Cup game against Zesco United. The Okyeman Planner bankroller earlier this week had made it known he will be in Zambia to help Kotoko pick a win against Zesco United in this crucial fixture. "I will do everything within my power to help Kotoko qualify to the next stage and that is exactly why I am leaving for Zambia", he told the media. The Porcupine Warriors are seeking to book their quarterfinals berth after failing to seal the qualification against Al Hilal at the Baba Yara Sports Stadium last. The Ghana Premier League side must beat the Zambians to seal their qualification. The game comes off on Sunday at the Levy Mwanawasa Stadium in Ndola. The much-anticipated game has been scheduled to kick off at 4pm.